Anders Breivik avoids what he calls the "humiliation" of being dismissed as a madman. The Oslo District Court has passed judgement on Anders Behring Breivik, the Norwegian mass-murderer who killed 77 people and wounded 242 in his attacks on UtÃ¸ya and Oslo. He was sentenced to 21 years imprisonment, the maximum possible under the law. Norway has the option of extending that sentence under preventative detention rules, which permit extended sentences so long as an inmate is considered dangerous to society. This decision means that the Court considers Breivik sane, and ignores the finding of court-appointed psychiatrists before the trial who claimed Breivik suffered from paranoid schizophrenia. Breivik has said during the trial that he would have considered a verdict of insanity as a "humiliation." Breivik used gaming addiction as an excuse to cover for his activities. He played World of Warcraft and modern military shooters for 12 months straight during what he described as a "sabbatical" intended to desensitise himself for the events to follow. "I played on the idea that 'Ooh, I've become addicted to games'," he claimed during the trial. "If you are going to be capable of executing such a bloody and horrendous operation," he said, "you need to work on your mind, your psyche, for years. We have seen from military traditions you cannot send an unprepared person into war." Friends and family were pleased when, at the end of this sabbatical period, he moved out of his mother's house to a farm several hours drive from Oslo. His addiction story had fooled them, and they were considering an intervention when he moved away. They felt he had shaken off his depression and was beginning to find a new lease on life. Unfortunately he had moved there to perfect bomb-making in a quiet, depopulated area, the better to avoid detection. Though the court's ruling on his sanity will have pleased Breivik, it will also please many of his surviving victims. 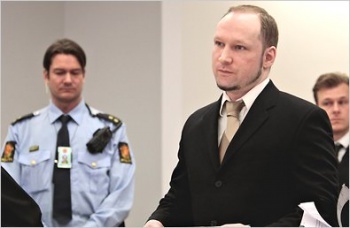 They were as anxious as he that he be declared sane, so that Breivik might spend the rest of his life in prison.